In 1945, in a now famous piece of archival footage, four-year-old Michael Bornstein was filmed by Soviet soldiers as he was carried out of Auschwitz in his grandmother’s arms. Here is the unforgettable story of how a father’s courageous wit, a mother’s fierce love, and one perfectly timed illness saved his life, and how others in his family from Zarki, Poland, dodged death time and again with incredible deftness. Working from his own recollections as well as extensive interviews with other family members and survivors who knew the family, Michael relates his inspirational story with the help of his daughter, Debbie Bornstein Holinstat. Shocking, heartbreaking, and ultimately uplifting, this narrative nonfiction offers an indelible depiction of what happened to one Polish village in the wake of the German invasion in 1939. 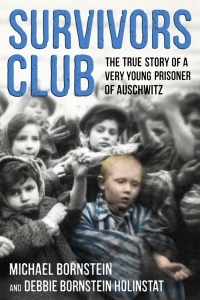 The incredible true story of one of the youngest survivors of Auschwitz - an accessible, inspirational Holocaust memoir for middle-grade readers.